An article by Science Editor Sarah Knapton on telegraph.co.uk - Cave paintings were an ancient zodiac mapping the skies, say experts - reports on research which relates Ice Age art with astronomy. 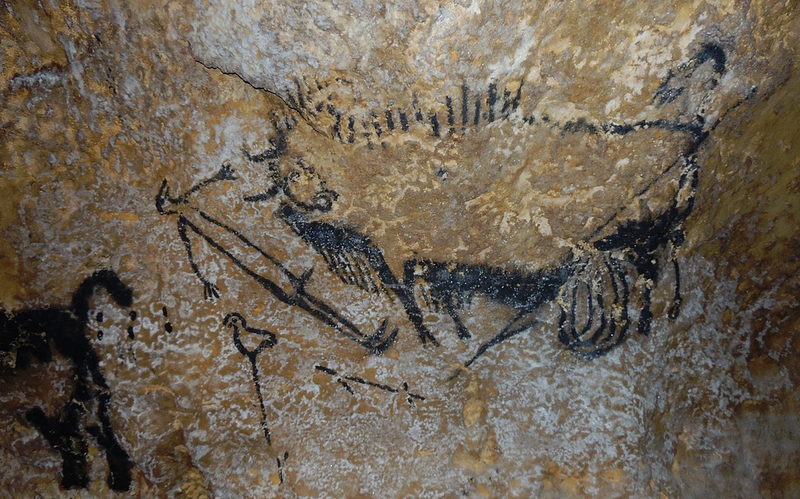 Researchers believe the Lascaux Shaft Scene may represent Libra, Capricorn and Taurus. Musee National de Prehistoire, Les Eyzies-de-Tayac-Sireuil, Dordogne, France. Animal symbol pictures in cave sites in France, Spain, Germany and Turkey were chemically dated by analysing the paint. Researchers then used software to recreate the night sky as it appeared then - 40,000 years ago - and mapped the cave paintings to the position of the stars. The researchers believe the drawings and paintings were placed - often, not necessarily always - by the artists to mark significant astrolonomical events, such as comet strikes. The results, published in Athens Journal of History, show that faunal depictions relate to zodiac signs based on constellations of that time. Dr. Martin Sweatman, the study leader, suggests that cave art points to the fact that people of the Ice Age had an advanced knowledge of the night sky. Editor's Note: There can be no doubt that an awareness and close observation of astronomy existed during the Ice Age. The only problem is that there are so many constellations and so much rock art that a match can be found by a computer program fairly easily. Incidentally, the article does not explain the Lascaux Shaft scene association.